Posted on April 15, 2013 by Ronald Patrick Raab, C.S.C. We gathered yesterday, Sunday April 14, 2013 for our first Easter storytelling session. Stories for the Journey: An Easter Celebration began with Tom Frieberg’s story, Move’n On. I also told my story, Dennis and the Cup Maker. This story celebrates my 30th anniversary of ordination, years of ministry learning how to feed people from my own hunger to belong in the world. I am delighted that our stories are creating such a wonderful, beautiful response in our community, such an Easter blessing and gift. Thank you, Tom for initiating this idea in our parish community. 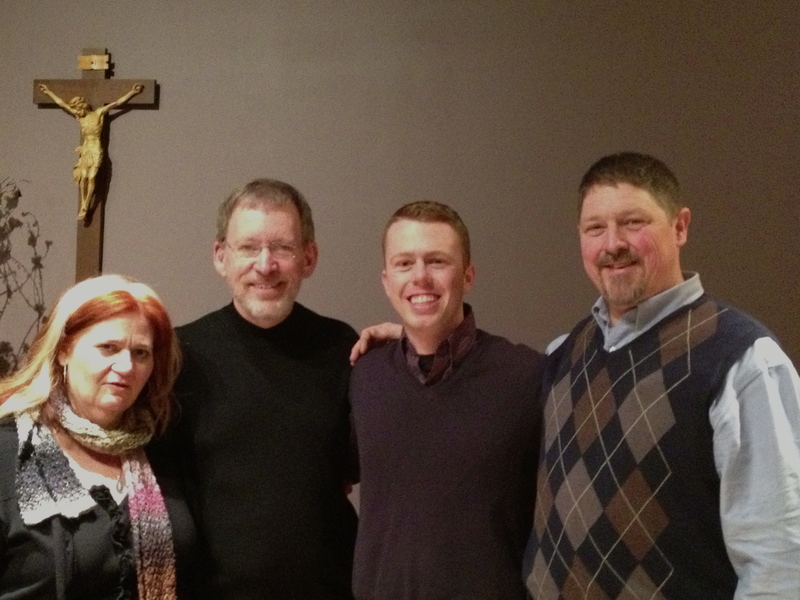 JB and Jeremy will tell their Easter stories on Sunday April 28, 2013 after the 10:00am Mass. These two stories from April 14 are based on the gospel from the Third Sunday of Easter, John 21:1-19. The photo: JB, Ron, Jeremy and Tom taken during the Lenten session.